The colors in this scan are a bit washed out… however, they are closer to accurate than the image that originally appeared in this post (which had a definite pink cast). My apologies for any inconvenience this has caused! I’m hoping to get back to Illuminata very soon as well. Thanks for your patience. 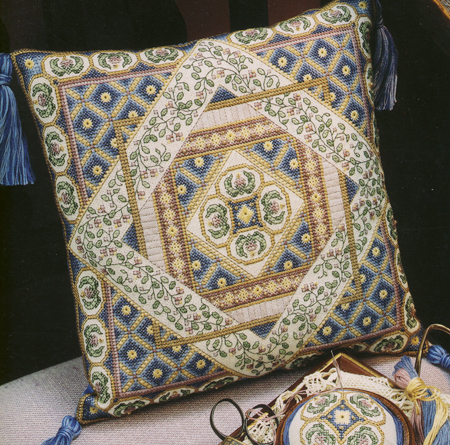 This entry was posted in Needlework and tagged counted cross stitch, Diamonds in Squares, PatternsOnLine.com. Bookmark the permalink. I wonder if you’ve ever thought of releasing this same pattern but in different colorways? I make beaded jewelry and I will do that with some designs. It’s amazing what a color change can accomplish…gives the piece an entirely different look. Thanks for stopping by and commenting! This design was released a LONG time ago… in fact, it was my first piece designed using a computer. The software I use is a CAD program, not a needlework designing software. Some of those programs allow a designer to change colors within designs to see what they will look like without having to stitch new models. Unfortunately, in my case, I would have to physically stitch new models to make sure I liked the color combinations… something time constraints simply didn’t (and still don’t) allow. 🙂 But, I ALWAYS encourage folks who use my patterns to change colors to suit their own tastes. And I agree with you: color changes can totally change how a design looks! Again, thanks for commenting! I love Diamond in square too!!! I will stitch it to myself some day! For the moment, I’m working on Rapunzel for my daughter. Thank you for sharing your talent! Absolutely gorgeous! You always have the most intricate designs! Oh yay! I am so excited for this! My next start after I finish Tradewinds is Tropical Dream. This will be added in at some point soon, too! Look forward to seeing more progress on Illuminata! The time things take is the time they take. 😀 I love Diamonds in Squares… someday I’ll pick my needle up again and start this. I’m so glad to hear that you’re doing well. This is gorgeous – I just love all the purple and the tassles just seal the deal! It’s so lovely! You may not be able to hear me, but I thank you all of the time for everything you have created over the years. Happy Spring!… and other things. Needlework Copyright Information How copyright infringement is affecting the needlework industry!